Entertainment features are equally integrated. First, the camera delivers excellent graphics with a 16MP and 12MP front and rear capture respectively to gratify the thirst of social media lovers who need quality photos and videos to share with friends and catch the fun. This is fully supported by the HD screen and high resolution that comes with it. Also, it features a three-in-one high-quality microphone and speaker to give adoring audio output for calls, recording and playing audio files. Extra security features, combined with Android Oreo which fully includes modern security technologies, ensure that Nokia 7 Plus is operated with maximum confidence as users' files and information are shielded from unauthorised access and use by attackers and malicious applications. Your privacy gets secured without any effort from. Quite a number of features makes this device an adorable smartphone. 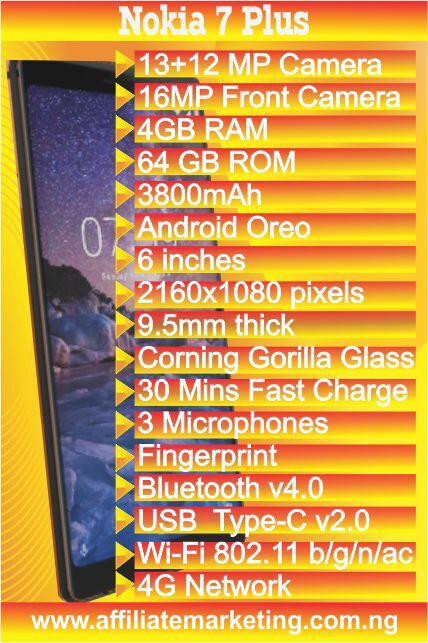 Its uniqueness is well spelt out by these features which include high-speed processing, security, efficient battery management, aesthetic appeal, High resolution and full HD display formats, large storage capacity, among others. With these features fully functional, nothing else can be compared to the satisfaction derived from using this device. Business-wise, it delivers a high ROI (return on investment) - value for money. Some of these features have been summarised below to help you understand what you'll derive from using Nokia 7 Plus. For sure, you'll be happy to graze this amazing device. Fully at 6 inches, Nokia 7 Plus has the display features that makes everything clearer and meaningful. The 18:9 display ratio presents an appropriate zoom level for higher definition display. Zoom displays to a resolution of 2160 x 1800 pixels and 1500:1 contrast ration. The touch interface is well protected with a laminated and polarised Corning® Gorilla® Glass 3 Material to provide the extra shield against damage. With these features, Nokia 7 Plus, fully supports the finest visual technologies demanded by smartphone users. Beauty was not left out of the design of this amazing smartphone. The design, clearly, reveals excellently crafted touches at the edges with inward curves that glitter and splashes light rays falling on them from adjacent view. Its subtle curves and ceramic-feel coating bring the best of both worlds of beauty and portability. The design-size allows a one-hand operation, at ease, with just a finger. As noted by the manufacturers, the body has been machined from a solid block of 6000 series aluminium to make it awesomely wonderful and crispy to handle for all mobile operations. Make your choice from two colour variations of while/copper and black/copper to suit your aesthetic appeal. Nothing is as painful as owning a smartphone with poor power management features. You will often times need to charge it to stay on the safer side and avoid power failure during important moments. Nokia 7 Plus functions on a 3800 mAh battery that grants an outstanding 2-day battery life. This long duration is due to the fact that this device runs on Android Oreo OS which combines awesome power management features to extend performance. Features such as background apps manager, connections manager, and the default power management console ensures that the battery life of this smartphone is extended to power heavy-weight usage. Playing games, watching movies, listening to audio, and socialising isn't a problem to the durability of the power. you will have enough hours to carry out your activities before the next charge of which a fast charge of 50% within 30 minutes is fully supported. As one of the smartphone feature users look out for in modern mobile devices, Nokia 7 Plus integrates excellent storage functions to clear doubts. A 4 GB LPDDR RAM is fully integrated to support fast operations by the by the processor. Storing files and documents are even more enhanced with a ROM (internal memory) size of 64 GB. More storage space can be added to this with a MicroSD card up to 256 GB. This will allow users to store important and easily required files on the device and be able to access them on-the-go, anywhere anytime. Nokia 7 Plus maintains the originality of the Android OS as it fully operates on Android Oreo. Android One is a fully streamlined Android OS with a curated set of pre-installed apps. This Android version features regular security updates and integrates modern Google innovations for smartness. Get apps controlled to manage storage and speed up performance from this well designed and tailored mobile OS. You had like to secure your device with an extra feature provided by the fingerprint sensor. The sensor is nicely fitted at the rear of the device just below the rear cameras. You can use the sensor, to perform a number of operations such as browse photos in full-screen mode, record calls, protect the device from unauthorised access and capture photographs with a finger. Capture every moment with excellent graphics and display features. The 16 MP front camera integrates with ZEISS optics and great low-light performance capabilities that allows you to take cool selfies, day or night. You don’t have to miss out on those appealing moments with friends. With a new Pro Camera mode included in the build of Nokia 7 Plus, you can easily adjust white balance, ISO, focus, shutter speed and exposure to keep images are natural as possible. No more blurred moving images! Play audio files with great pleasure and clarity of sound delivered by a smart amp speaker. Use the three featured microphones with Nokia OZO Audio to produce quality sounds. The 4 GB RAM and Qualcomm® Snapdragon ™ 660 processor combines perfectly to optimise everything on the device. Background apps are properly managed and redundant log files are cleared to provide extra operational space for speed. Additionally, a number of security features ensure that your information and documents are duly protected against unauthorised access. Download apps using well-secured Google Play Store that features Play Protect. Use fingerprint sensor to add extra security to your device and stay safe. 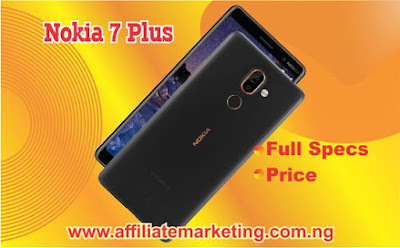 Nokia 7 Plus is available for purchase on Jumia and the price ranges from ＄382.80 (₦138,000) to $402.22 (₦145,000). Nokia 7 Plus is an extremely great smartphone you can lay your hands on and feel satisfied with its excellent features. Whether you are looking for a phone to meet your social media needs, large storage for your files, high security, or fast and reliable performance, Nokia 7 Plus provides just that for you. You live to tell others the story of this wonderful device.